Jean Hugo was born in Paris in 1894, the son of Georges Hugo and his wife, Pauline Ménard-Dorian. His wife’s family owned a holiday home on the cliffs at Icart in Guernsey known as La Marcherie. From 1907 until 1910 Jean was at school at Elizabeth College in Guernsey. He enjoyed his time at school here greatly; he played football, was very good at boxing (his bony physique gave him a long reach ! ), did a great turn in the annual French school play, won prizes for French and Latin and excelled at art. He was in School House and during term time probably boarded. We do not know if he remained in Guernsey for the summer, although he did say in his memoirs that the Sundays he spent in Guernsey were among the best of his life. He recalled his school years in Guernsey in a beautifully written vignette in the second of his two biographical works, Le Regard de la mémoire, which was published just before his death and takes his life up to 1945. After leaving College he attended sixth-form in Paris. Like his father he joined up as soon as he could, in 1914. He was wounded in May 1915 at La Targette in Pas-de-Calais, and rejoined the front in September 1915. He commenced then an extensive series of delicate sketches and drawings of operations in Artois, Verdun, and Picardy, which he continued until 1918. They depict war-torn landscapes and scenes of soldiers’ lives at the front and behind the lines. Aside from their artistic merit they join his father’s war sketches as being very valuable documentary evidence of WWI. Hugo went on to mix with the artistic post-war elite, amongst whom he counted as great friends such luminaries as Jean Cocteau, Pablo Picasso, Paul Eluard, Francis Poulenc, Max Jacob, Cecil Beaton and Eric Satie. As well as painting vividly in oils he illustrated books with watercolours and lithographs. He was particularly interested in the theatre and designed costumes and sets, for which he produced exquisite maquettes. His work was greatly appreciated in the UK and America, and he painted backdrops of Stratford-upon-Avon for the Quatercentenary of Shakespeare‘s birth in 1964 which are in the collection of the V&A. In 1931 he acquired an estate in Provence, the Mas de Fourques at Lunel, which remained his base until his death in 1984. He married twice, first to artist Valentine Grossman, and secondly to Laura Hope-Nicholson, by whom he had seven children. Maurice Sachs: ‘Jean Hugo was calm, kind and generous. Life flowed calmly before him and as far as we knew he had no enemies. He carried the heavy burden of his family name with elegance. Like his father Georges Hugo he was a man of the world, a man of great distinction in heart and spirit, a kind friend, a man you would want to have in your life.’ La Décade de l'illusion (Paris: Gallimard, 1950 pp. 14–16). 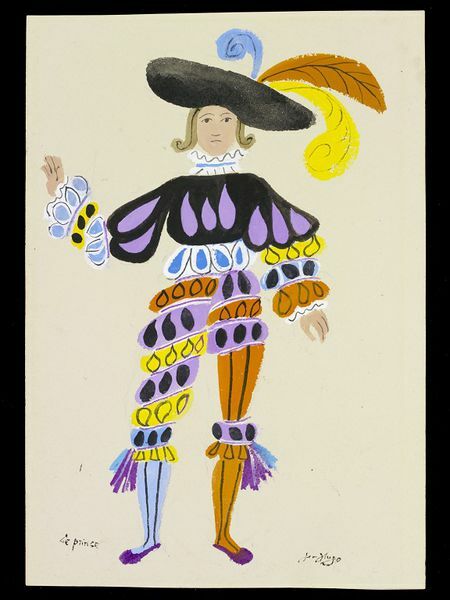 Projected costume design for 'The Prince' by Jean Hugo, Les Cents Baisers, Royal Opera House, Covent Garden, 1935. In the collection of the V&A, Museum no. S.450-19.